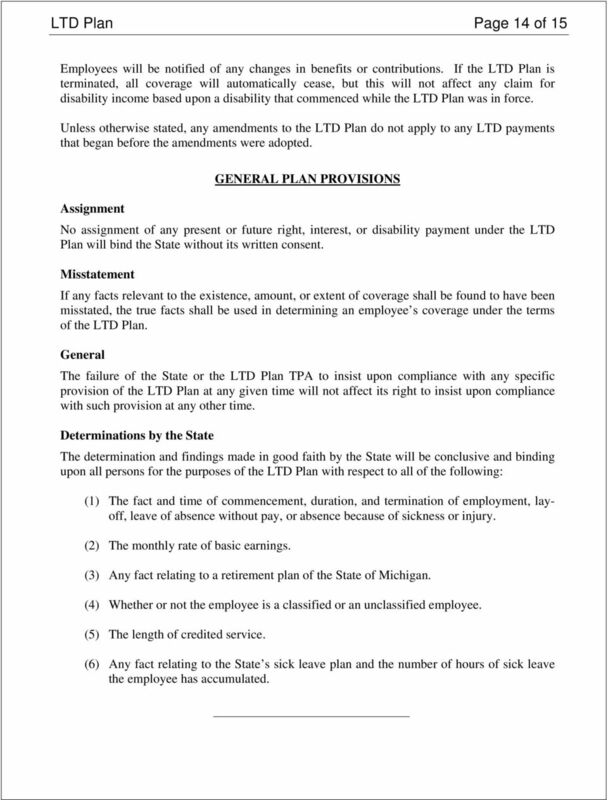 Download "STATE OF MICHIGAN LONG TERM DISABILITY INCOME PROTECTION PLAN October 1, 2007"
3 LTD Plan Page 3 of 15 GENERAL DEFINITIONS Unless the context clearly provides otherwise, the following terms in the LTD Plan are defined as follows: (1) Actively working means performing the duties of the claimant s usual occupation. (2) Basic hours means paid hours of work excluding overtime. (3) Eligible employee classes means all of the following: (a) Executive branch classified employees identified as eligible for the LTD Plan in Civil Service Commission Rule , Eligibility for Group Insurance Plans. (b) Executive branch unclassified employees who participate in a formal sick leave plan as described for classified employees. (c) Employees of the judicial and legislative branches. (4) Independent medical examination means a medical examination conducted by an independent health care professional designated by the State or the LTD Plan TPA. (5) Legally incapacitated means impaired by reason of mental illness, mental deficiency, physical illness or disability, chronic use of drugs, chronic intoxication, or other cause, not including being a minor, to the extent that the person lacks sufficient understanding or capacity to make or communicate responsible decisions concerning his or her person or welfare. 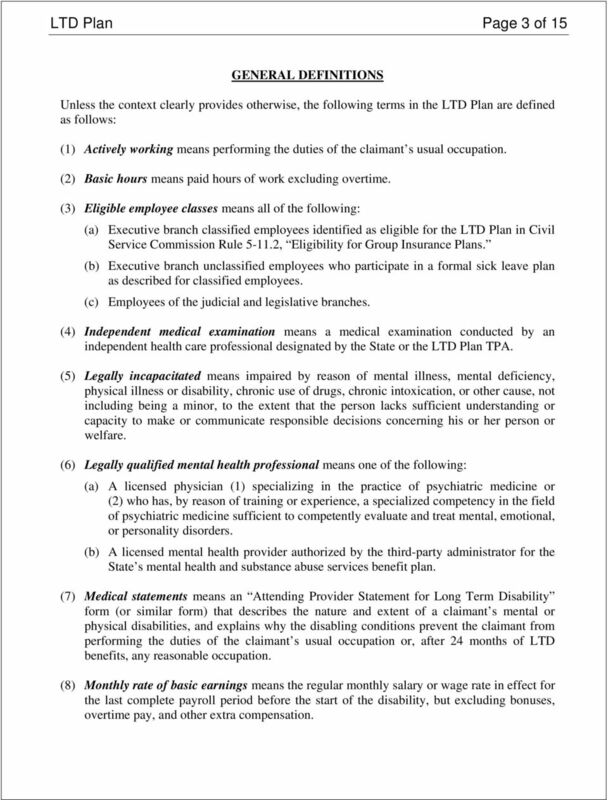 (6) Legally qualified mental health professional means one of the following: (a) A licensed physician (1) specializing in the practice of psychiatric medicine or (2) who has, by reason of training or experience, a specialized competency in the field of psychiatric medicine sufficient to competently evaluate and treat mental, emotional, or personality disorders. (b) A licensed mental health provider authorized by the third-party administrator for the State s mental health and substance abuse services benefit plan. 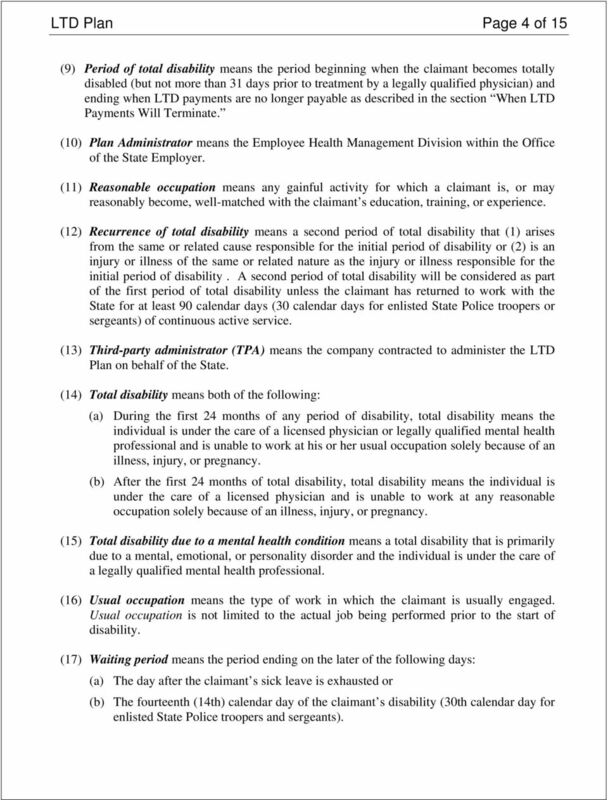 (7) Medical statements means an Attending Provider Statement for Long Term Disability form (or similar form) that describes the nature and extent of a claimant s mental or physical disabilities, and explains why the disabling conditions prevent the claimant from performing the duties of the claimant s usual occupation or, after 24 months of LTD benefits, any reasonable occupation. (8) Monthly rate of basic earnings means the regular monthly salary or wage rate in effect for the last complete payroll period before the start of the disability, but excluding bonuses, overtime pay, and other extra compensation. 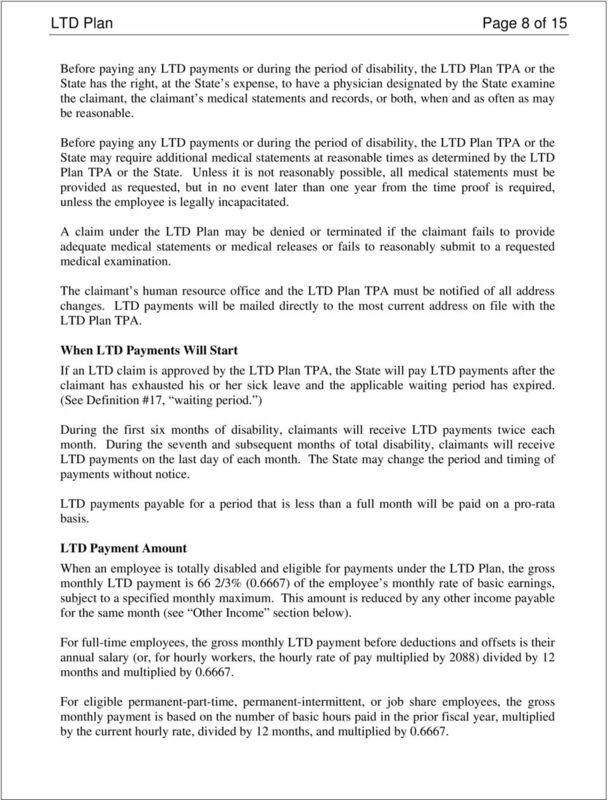 4 LTD Plan Page 4 of 15 (9) Period of total disability means the period beginning when the claimant becomes totally disabled (but not more than 31 days prior to treatment by a legally qualified physician) and ending when LTD payments are no longer payable as described in the section When LTD Payments Will Terminate. (10) Plan Administrator means the Employee Health Management Division within the Office of the State Employer. (11) Reasonable occupation means any gainful activity for which a claimant is, or may reasonably become, well-matched with the claimant s education, training, or experience. (12) Recurrence of total disability means a second period of total disability that (1) arises from the same or related cause responsible for the initial period of disability or (2) is an injury or illness of the same or related nature as the injury or illness responsible for the initial period of disability. A second period of total disability will be considered as part of the first period of total disability unless the claimant has returned to work with the State for at least 90 calendar days (30 calendar days for enlisted State Police troopers or sergeants) of continuous active service. (13) Third-party administrator (TPA) means the company contracted to administer the LTD Plan on behalf of the State. (14) Total disability means both of the following: (a) During the first 24 months of any period of disability, total disability means the individual is under the care of a licensed physician or legally qualified mental health professional and is unable to work at his or her usual occupation solely because of an illness, injury, or pregnancy. (b) After the first 24 months of total disability, total disability means the individual is under the care of a licensed physician and is unable to work at any reasonable occupation solely because of an illness, injury, or pregnancy. (15) Total disability due to a mental health condition means a total disability that is primarily due to a mental, emotional, or personality disorder and the individual is under the care of a legally qualified mental health professional. (16) Usual occupation means the type of work in which the claimant is usually engaged. Usual occupation is not limited to the actual job being performed prior to the start of disability. (17) Waiting period means the period ending on the later of the following days: (a) The day after the claimant s sick leave is exhausted or (b) The fourteenth (14th) calendar day of the claimant s disability (30th calendar day for enlisted State Police troopers and sergeants). 5 LTD Plan Page 5 of 15 ENROLLMENT When an eligible employee enrolls in the LTD Plan, the employee will be enrolled in one of the two following plans, according to the number of accumulated sick leave hours on the date of enrollment: PLAN I For employees who have fewer than 184 hours of accumulated sick leave. PLAN II For employees who have 184 or more hours of sick leave. An employee enrolled in Plan I who accrues 184 or more hours of sick leave is automatically enrolled in Plan II. Once an employee is enrolled in Plan II, the employee will not be reclassified to Plan I as long as the employee remains continuously enrolled in the LTD Plan even if the employee s accumulated sick leave balance falls below 184 hours. Premium Classes for Employees Enrolled in the Plan. An eligible employee enrolled in the LTD Plan must pay the premium required for the appropriate premium class: Plan I Premium Class - Employees enrolled in Plan I having fewer than 184 hours of accumulated sick leave. Plan II(A) Premium Class - Employees enrolled in Plan II having at least 184 hours but fewer than 528 hours of accumulated sick leave. Plan II(B) Premium Class - Employees enrolled in Plan II having 528 hours or more of accumulated sick leave. Plan II(C) Premium Class Employees enrolled in Plan II whose accumulated sick leave balance has fallen below 184 hours. The Employee Health Management Division annually provides an LTD premium schedule. Changes in LTD Plan coverage or premiums take place at the beginning of the pay period after the pay period in which the employee s sick leave hours permit a change in Premium Class. On the date a full-time employee becomes covered under the LTD Plan, his or her biweekly LTD premium is calculated by first computing the annual wages for full-time service (for salaried employees, this is the annual salary; for hourly employees, the employee s current hourly rate of pay is multiplied by 2088 hours). The annual wages are then divided by 26 (pay periods in a year), then divided by 100. The resulting amount is then multiplied by the premium rate that applies to the employee s specific Premium Class. For employees working less than full-time (e.g., Permanent Intermittent, Part-Time, Job Share, etc. ), the premium is calculated by averaging the previous six pay period basic hours, multiplied by the current hourly rate of pay, divided by 100, and multiplied by the premium rate that applies to the employee s specific Premium Class. 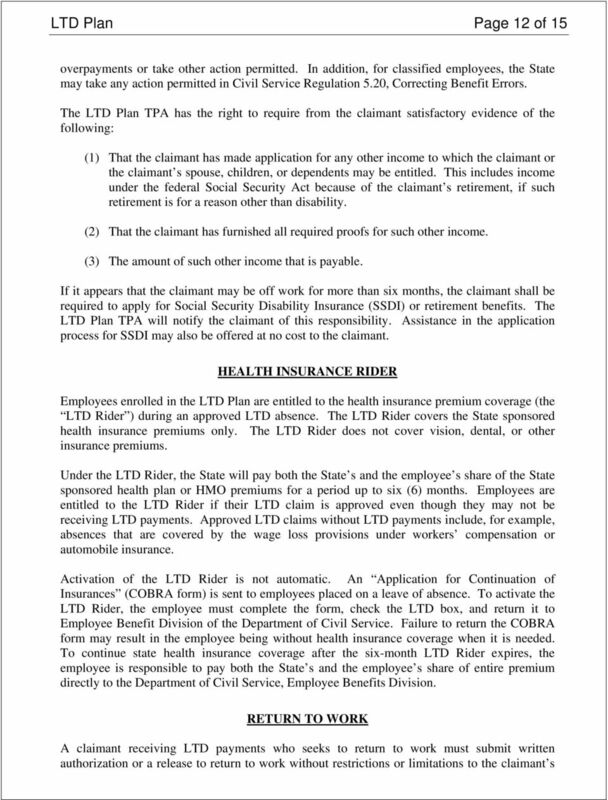 6 LTD Plan Page 6 of 15 Premiums due will be deducted from employee s pay on a biweekly basis. Newly hired employees are eligible to enroll in the LTD Plan within the first 31 days after they are hired. After the first 31 days from hire, employees are eligible to enroll in the LTD Plan only during the annual Open Enrollment Period, with an effective coverage date as announced by the State. Employees may call the MI-HR Service Center to enroll. The Plan Administrator may enroll or re-enroll an employee on an exception basis, if the employee s department of human resource office attests that the State erred in the enrollment process. Employees enrolled in the LTD Plan at the time they are placed on an unpaid leave of absence or layoff will, upon their return to work in an eligible employee class, be automatically reenrolled in the LTD Premium Class consistent with their accumulated sick leave hours at that time. Coverage Begins COVERAGE In order to be covered under the Plan, newly hired employees must be actively working throughout their normally scheduled work-week. Newly hired employees who enroll in the LTD Plan immediately upon hire will become eligible for coverage on the first day of the first pay period after the employee completes one full pay period of employment. Newly hired employees applying for enrollment after the first pay period, but within 31 days after the date of hire, will become eligible for coverage on the first day of the first pay period following the date of enrollment. Termination of Coverage An employee s coverage will terminate under the LTD Plan on the earliest of the following dates: (1) The last day of the pay period in which the employee stops his or her LTD Plan premium payment. (2) The date the employee is no longer in active pay status. (3) The date the LTD Plan is discontinued. (4) The date employment with the State of Michigan terminates. 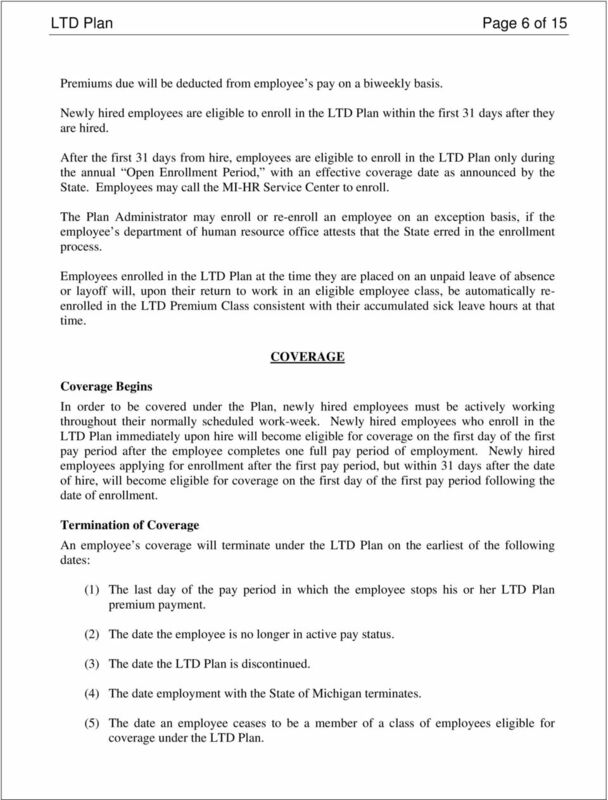 (5) The date an employee ceases to be a member of a class of employees eligible for coverage under the LTD Plan. 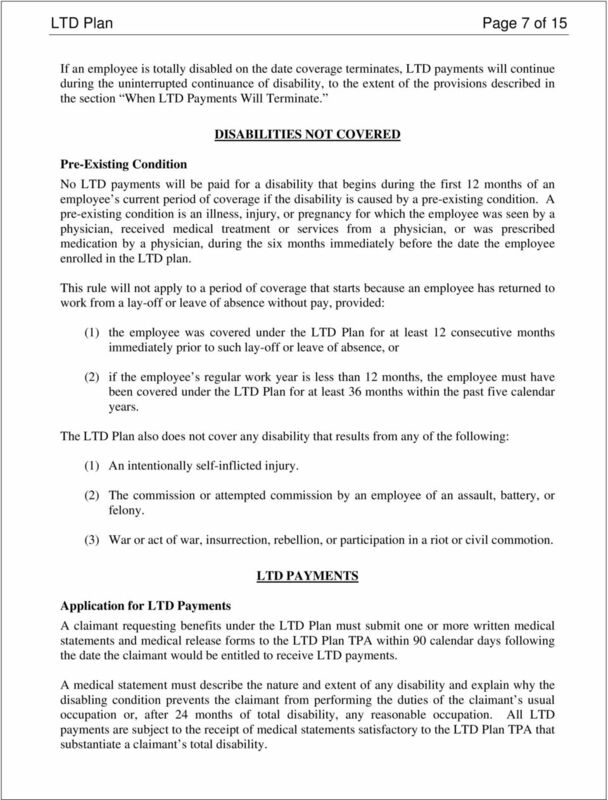 7 LTD Plan Page 7 of 15 If an employee is totally disabled on the date coverage terminates, LTD payments will continue during the uninterrupted continuance of disability, to the extent of the provisions described in the section When LTD Payments Will Terminate. Pre-Existing Condition DISABILITIES NOT COVERED No LTD payments will be paid for a disability that begins during the first 12 months of an employee s current period of coverage if the disability is caused by a pre-existing condition. A pre-existing condition is an illness, injury, or pregnancy for which the employee was seen by a physician, received medical treatment or services from a physician, or was prescribed medication by a physician, during the six months immediately before the date the employee enrolled in the LTD plan. 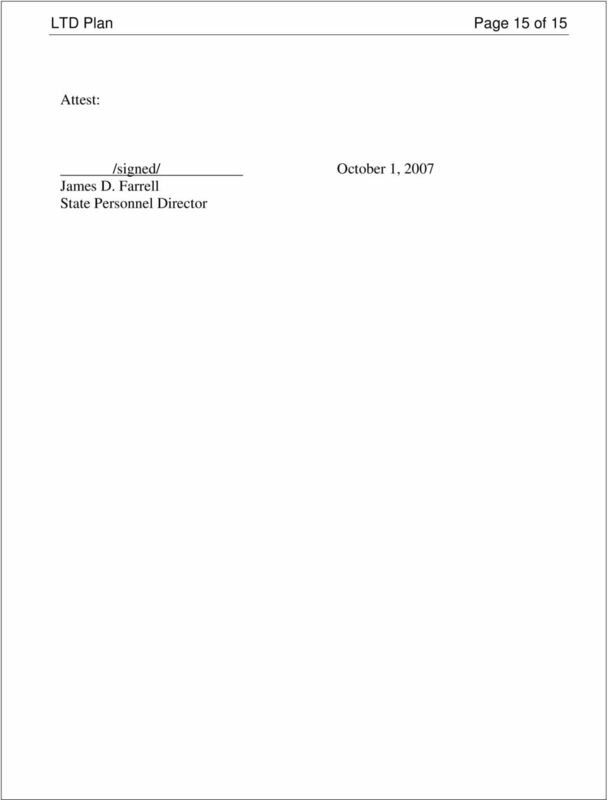 This rule will not apply to a period of coverage that starts because an employee has returned to work from a lay-off or leave of absence without pay, provided: (1) the employee was covered under the LTD Plan for at least 12 consecutive months immediately prior to such lay-off or leave of absence, or (2) if the employee s regular work year is less than 12 months, the employee must have been covered under the LTD Plan for at least 36 months within the past five calendar years. The LTD Plan also does not cover any disability that results from any of the following: (1) An intentionally self-inflicted injury. (2) The commission or attempted commission by an employee of an assault, battery, or felony. (3) War or act of war, insurrection, rebellion, or participation in a riot or civil commotion. LTD PAYMENTS Application for LTD Payments A claimant requesting benefits under the LTD Plan must submit one or more written medical statements and medical release forms to the LTD Plan TPA within 90 calendar days following the date the claimant would be entitled to receive LTD payments. A medical statement must describe the nature and extent of any disability and explain why the disabling condition prevents the claimant from performing the duties of the claimant s usual occupation or, after 24 months of total disability, any reasonable occupation. All LTD payments are subject to the receipt of medical statements satisfactory to the LTD Plan TPA that substantiate a claimant s total disability. 9 LTD Plan Page 9 of 15 For employees receiving LTD payments twice a month, the semi-monthly payment is calculated by dividing the gross monthly payment by two. Return to Work on Reduced Hours Partial LTD payments are calculated by subtracting 80% of the gross pay for the basic hours worked from the gross LTD payment. The calculation is made on a monthly or twice monthly basis, as appropriate. Employees working reduced hours must provide proof of earnings. 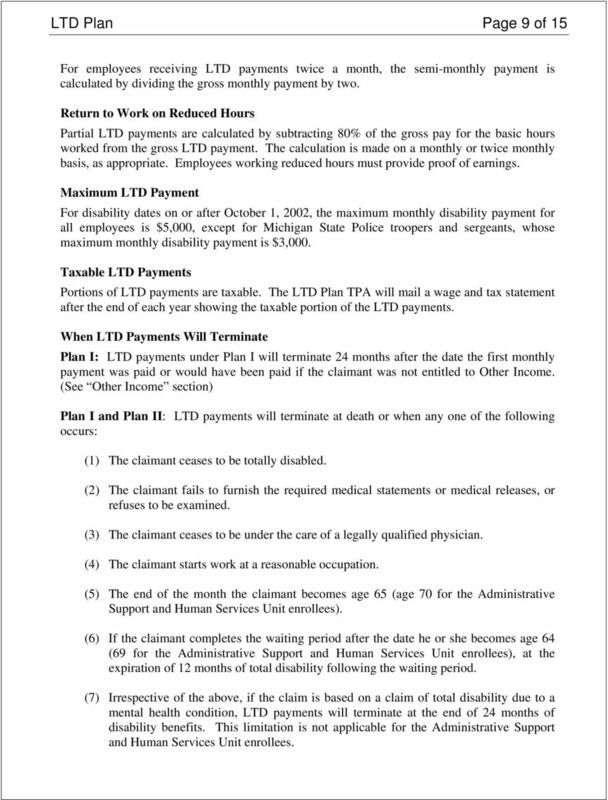 Maximum LTD Payment For disability dates on or after October 1, 2002, the maximum monthly disability payment for all employees is $5,000, except for Michigan State Police troopers and sergeants, whose maximum monthly disability payment is $3,000. Taxable LTD Payments Portions of LTD payments are taxable. The LTD Plan TPA will mail a wage and tax statement after the end of each year showing the taxable portion of the LTD payments. When LTD Payments Will Terminate Plan I: LTD payments under Plan I will terminate 24 months after the date the first monthly payment was paid or would have been paid if the claimant was not entitled to Other Income. (See Other Income section) Plan I and Plan II: LTD payments will terminate at death or when any one of the following occurs: (1) The claimant ceases to be totally disabled. (2) The claimant fails to furnish the required medical statements or medical releases, or refuses to be examined. (3) The claimant ceases to be under the care of a legally qualified physician. (4) The claimant starts work at a reasonable occupation. (5) The end of the month the claimant becomes age 65 (age 70 for the Administrative Support and Human Services Unit enrollees). (6) If the claimant completes the waiting period after the date he or she becomes age 64 (69 for the Administrative Support and Human Services Unit enrollees), at the expiration of 12 months of total disability following the waiting period. (7) Irrespective of the above, if the claim is based on a claim of total disability due to a mental health condition, LTD payments will terminate at the end of 24 months of disability benefits. This limitation is not applicable for the Administrative Support and Human Services Unit enrollees. 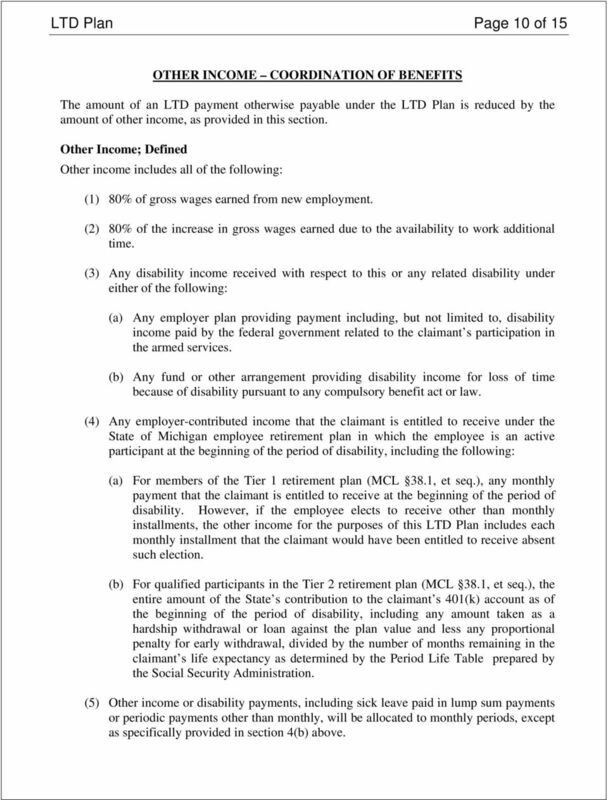 10 LTD Plan Page 10 of 15 OTHER INCOME COORDINATION OF BENEFITS The amount of an LTD payment otherwise payable under the LTD Plan is reduced by the amount of other income, as provided in this section. Other Income; Defined Other income includes all of the following: (1) 80% of gross wages earned from new employment. (2) 80% of the increase in gross wages earned due to the availability to work additional time. 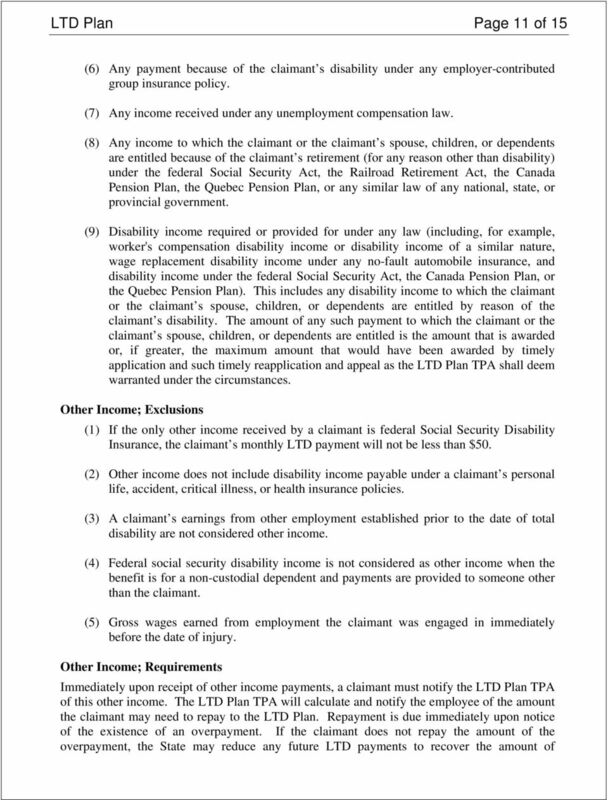 (3) Any disability income received with respect to this or any related disability under either of the following: (a) Any employer plan providing payment including, but not limited to, disability income paid by the federal government related to the claimant s participation in the armed services. (b) Any fund or other arrangement providing disability income for loss of time because of disability pursuant to any compulsory benefit act or law. 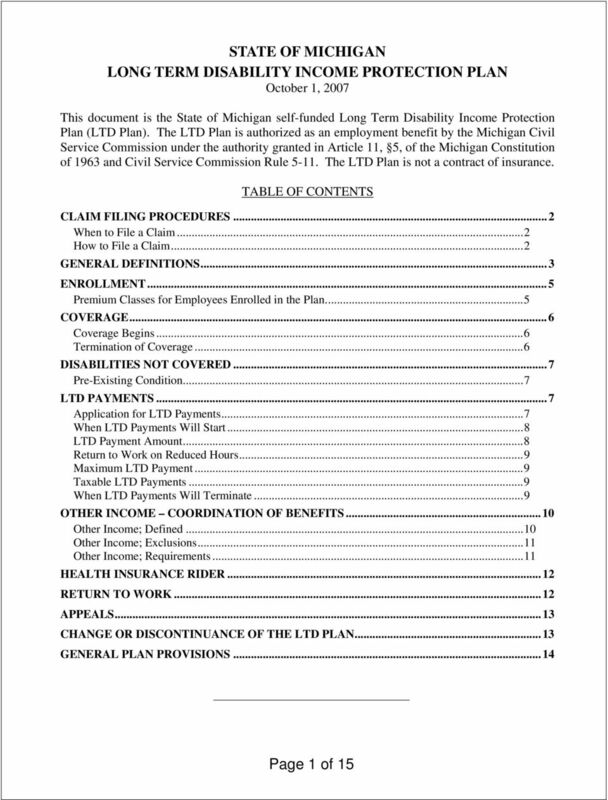 (4) Any employer-contributed income that the claimant is entitled to receive under the State of Michigan employee retirement plan in which the employee is an active participant at the beginning of the period of disability, including the following: (a) For members of the Tier 1 retirement plan (MCL 38.1, et seq. ), any monthly payment that the claimant is entitled to receive at the beginning of the period of disability. However, if the employee elects to receive other than monthly installments, the other income for the purposes of this LTD Plan includes each monthly installment that the claimant would have been entitled to receive absent such election. (b) For qualified participants in the Tier 2 retirement plan (MCL 38.1, et seq. ), the entire amount of the State s contribution to the claimant s 401(k) account as of the beginning of the period of disability, including any amount taken as a hardship withdrawal or loan against the plan value and less any proportional penalty for early withdrawal, divided by the number of months remaining in the claimant s life expectancy as determined by the Period Life Table prepared by the Social Security Administration. (5) Other income or disability payments, including sick leave paid in lump sum payments or periodic payments other than monthly, will be allocated to monthly periods, except as specifically provided in section 4(b) above. 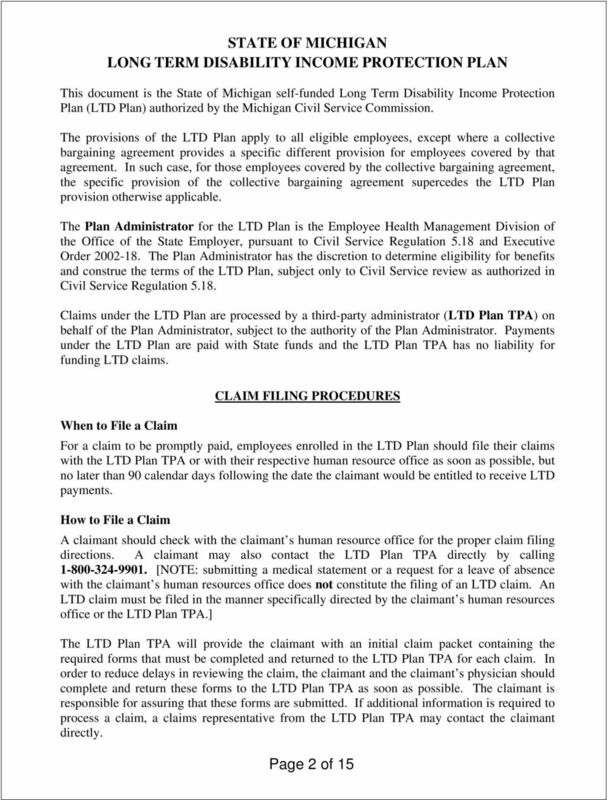 13 LTD Plan Page 13 of 15 human resources office and the LTD Plan TPA, on or before the date an employee is expected to return to work. The request to return to work must comply with all other applicable provisions of the Civil Service rules and regulations, departmental work rules, and collective bargaining agreements related to medical leaves of absence and return-to-work. A claimant who has not fully recovered from total disability is encouraged to seek return-towork on a less than full-time basis at the claimant s own job, a modified job, a transitional employment assignment, or other employment. A claimant requesting to return to work with restrictions or limitations or to return on a reduced-hours basis must have a written authorization or release from the claimant s treatment provider. This authorization or release must describe the claimant s abilities (i.e., what the claimant is able to do), any limitations or restrictions, the hours of work per day or days per week permitted to work, and, if applicable, an outline of a gradual increasing number of hours or days to return to the claimant s regularly scheduled work hours. The authorization or release is required to have an estimated date of when the claimant is expected to be able to return to the claimant s regular schedule and duties or the date of the claimant s next follow-up visit. Indefinite or open-ended dates are not acceptable. Any written authorization or release that includes restrictions or limitations must be submitted to the claimant s human resources office for approval and the LTD Plan TPA before the date an employee is expected to return to work. APPEALS If an LTD claim is terminated or denied, the LTD Plan TPA will send the claimant a written decision and explanation of the reasons for the termination or denial. A claimant may appeal the LTD Plan TPA s termination or denial of a claim only as provided in the LTD Plan TPA s appeal process. An appeal must be submitted in writing to the LTD Plan TPA within the time frame specified in the LTD Plan TPA s decision. An appeal must be sent to the LTD Plan TPA at the address indicated in the TPA s decision. 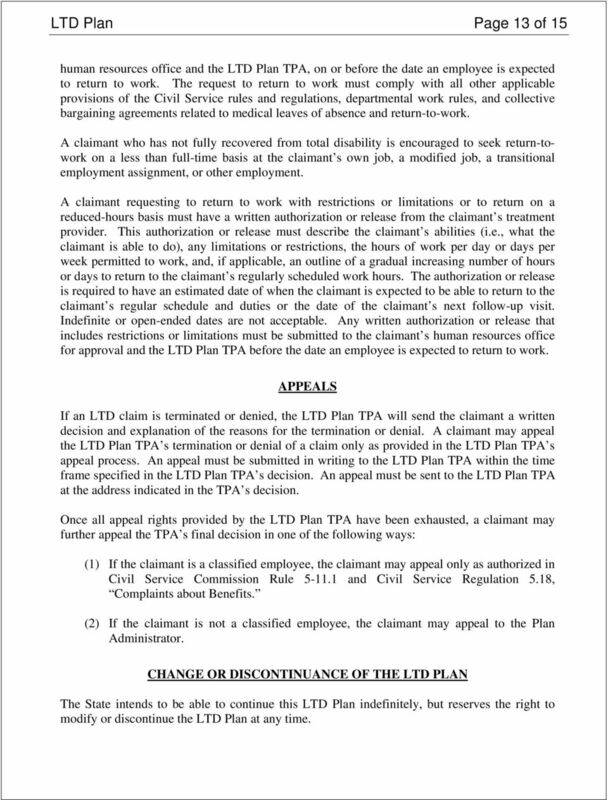 Once all appeal rights provided by the LTD Plan TPA have been exhausted, a claimant may further appeal the TPA s final decision in one of the following ways: (1) If the claimant is a classified employee, the claimant may appeal only as authorized in Civil Service Commission Rule and Civil Service Regulation 5.18, Complaints about Benefits. (2) If the claimant is not a classified employee, the claimant may appeal to the Plan Administrator. CHANGE OR DISCONTINUANCE OF THE LTD PLAN The State intends to be able to continue this LTD Plan indefinitely, but reserves the right to modify or discontinue the LTD Plan at any time. 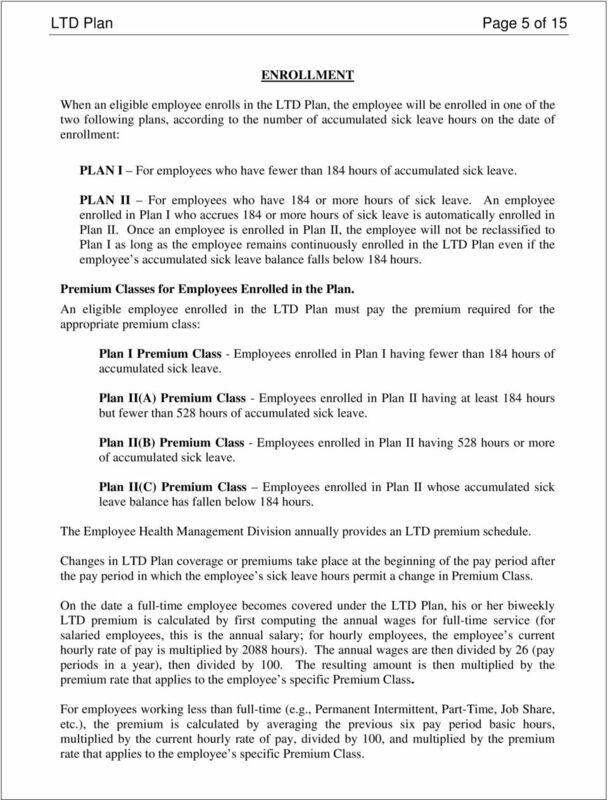 14 LTD Plan Page 14 of 15 Employees will be notified of any changes in benefits or contributions. If the LTD Plan is terminated, all coverage will automatically cease, but this will not affect any claim for disability income based upon a disability that commenced while the LTD Plan was in force. Unless otherwise stated, any amendments to the LTD Plan do not apply to any LTD payments that began before the amendments were adopted. Assignment GENERAL PLAN PROVISIONS No assignment of any present or future right, interest, or disability payment under the LTD Plan will bind the State without its written consent. Misstatement If any facts relevant to the existence, amount, or extent of coverage shall be found to have been misstated, the true facts shall be used in determining an employee s coverage under the terms of the LTD Plan. General The failure of the State or the LTD Plan TPA to insist upon compliance with any specific provision of the LTD Plan at any given time will not affect its right to insist upon compliance with such provision at any other time. Determinations by the State The determination and findings made in good faith by the State will be conclusive and binding upon all persons for the purposes of the LTD Plan with respect to all of the following: (1) The fact and time of commencement, duration, and termination of employment, layoff, leave of absence without pay, or absence because of sickness or injury. (2) The monthly rate of basic earnings. (3) Any fact relating to a retirement plan of the State of Michigan. (4) Whether or not the employee is a classified or an unclassified employee. (5) The length of credited service. (6) Any fact relating to the State s sick leave plan and the number of hours of sick leave the employee has accumulated. Long-Term Disability Insurance Benefits Under the Lockheed Martin Group Benefits Plan and the Lockheed Martin Operations Support, Inc.